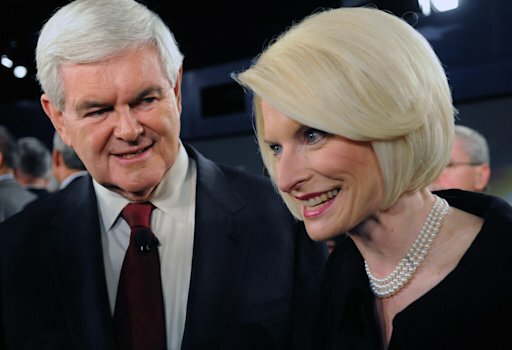 Seriously, this isn’t a joke: Halperin thought Perry was excellent tonight!!!!! President Obama on Wednesday announced a plan to allow college graduates to cap federal student loan repayments at 10 percent of discretionary income starting in January, two years before the cap was due to take effect under federal law. The accelerated “pay as you earn” program, which Obama will authorize through executive order, could benefit up to 1.6 million borrowers and reduce their payments by as much as a couple hundred dollars a month, administration officials said. All remaining debt on the federal loans would be forgiven after 20 years – five years earlier than under current law. Reuters: …. President Obama’s appearance on “The Tonight Show With Jay Leno” lifted the show to its highest Tuesday-night ratings since March 2, 2010, the night after Leno returned to the show. Tuesday’s episode received a 4.1/11 metered-market household rating, a 52 percent leap over his Tuesday-night average so far this season. With Obama’s appearance,” The Tonight Show” handily surpassed “Late Show with David Letterman,” which posted a 2.7/7 household rating, “Nightline,” which drew a 3.6/9, and “Jimmy Kimmel Live,” which received a 1.8./6. Ruth Marcus (Washington Post): In an interview with Parade magazine, the Texas governor declared Obama’s place of birth a “distractive” issue even as he happily latched on to the opportunity to distract ….. It was classic Perry, combining logical incoherence and a smarmy cheap shot. …. Is this a presidential campaign or a middle-school playground? I’ll show you mine if you show me yours? By the way, if I had Perry’s grades, I wouldn’t be mentioning them. Certainly not if I were running against a former president of the Harvard Law Review. …. You might think this was the candidate cannily trying to have it both ways: a nod to the birther crazies with a simultaneous wink at those who know this is a ridiculous distraction. Except that Perry managed to step on his real message of the day: his unaffordable and unfair proposal to “simplify” the tax code – by grafting a flat-tax alternative onto the existing system. …. The matter of Obama’s birth certificate should be a closed case. It is astonishing that a sitting governor, no less a serious candidate for president, would stoop to playing this game. … The country is facing serious problems. This will be a fateful election. Voters deserve better than scare tactics and drivel. President Obama returns a salute as he steps off Marine One helicopter on the South Lawn of the White House as he returned from a three day trip to Nevada, California and Colorado. Steve Benen: At an event in North Carolina yesterday, President Obama talked up the next phase in the fight over job creation. We knew Dems would start to move on individual provisions within the American Jobs Act, and yesterday, we learned which component would go first. …. Why are Dems pursuing this first? It may have something to do with the idea’s overwhelming popularity – A whopping 75% supported the measure in a CNN poll …. even 63% of Republicans approve of the spending. …. the total number of Republican lawmakers in either chamber willing to support the teachers/first responders jobs bill – or even allow a vote on the bill – is currently zero, despite overwhelming support from the American mainstream. Greg Sargent: ‘Moderate’ Dems may break with Obama on pieces of jobs bill: With the Senate set to vote on pieces of the jobs bill, Senators Ben Nelson and Jon Tester, both of whom voted against the overall proposal, may actually vote against the $35 billion in state aid to avert teacher and first-responder layoffs. …. Romney has attracted $7.5 million from the financial community … That’s nearly twice as much as President Barack Obama has received from it, and almost a quarter of the $32 million that Romney’s campaign has taken in overall. …. Romney is the top recipient of campaign cash from employees of the five biggest Wall Street banks. Goldman Sachs gave the most — $352,200…. The other banks were Morgan Stanley ($184,800), Bank of America ($112,500), JP Morgan Chase & Co. ($107,250) and Citigroup Inc. ($56,550). A spokesman for the Romney campaign could not be reached for comment. … Obama had raised about $3.9 million in Wall Street contributions as of the end of September (just over 4 percent of his overall haul so far of $89 million, which dwarfs the GOP field). 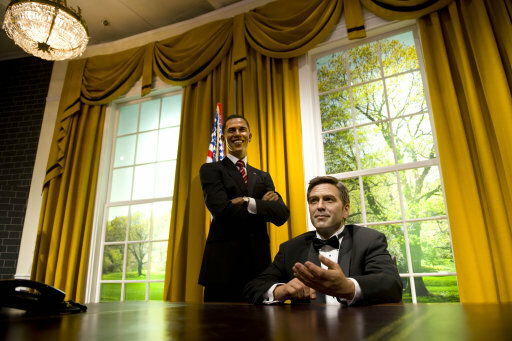 Caption: A waxwork figure of George Clooney on display at Madame Tussauds in London is posed alongside a waxwork of US president Barack Obama…. Jonathan Cohn (The New Republic): Remember when President Obama wouldn’t even utter the word “Republican”? Those days are long gone. And maybe, just maybe, the change in rhetoric is starting to pay off. We’re now into week four of the administration’s campaign to promote its jobs proposal. And instead of dialing down the pressure, Obama has been dialing it up…. … whether or not the Democrats have every single member in line is less important than whether they have 50 votes to pass it – because if they have the 50 votes, then the obstacle to enactment won’t be Democrats. It will be Republicans…. And that ought to matter to the voters. Everybody assumes Obama is campaigning hard for his jobs plan primarily to make a point to the voters about who stands for what, in advance of the 2012 elections. That’s probably true. But he’s adopted this posture because Republicans refuse to compromise. And if Republicans start to pay a political price for holding up popular legislation, there’s still a chance they will relent – and pass legislation before the year is done…. Business Week: Railroads shipments are the highest in almost three years, helping to defy concerns about a double-dip recession. … since reporting quarterly earnings in July, the three largest U.S. railroads haven’t given any indication of a sharp decline in demand similar to 2008 and 2009, when volumes fell as much as 24 percent on an annual basis. …. Earlier this month, CSX’s Chief Financial Officer Oscar Munoz said he isn’t concerned about “any kind of overarching sort of dire circumstances around the corner,” as there is still a “general level of optimism” among customers and suppliers. “Sure, things have moderated, but there is no one in that near state of panic that we saw certainly in late ‘08 and ‘09,” Munoz said…. … legislating? The House of Representatives? The 112th Congress? Hard to believe that Boehner could say that one without bursting out laughing. The current House has done hardly any legislating at all. They could barely pass a bill to keep the government’s lights on back in the spring, and they almost send the nation into default in the summer…..
…. The key here is that real legislating requires compromise, especially during times of divided government. And House Republicans have no intention of compromising with either the Senate or with Barack Obama … Even now, if Boehner really offered to deal on jobs, I don’t think anyone doubts that Obama would hop off the campaign trail and try to work something out. But there will be no legislating, because the House isn’t going to do it. No matter what talking points John Boehner might trot out. GOPolitico’s race-baiter supreme, Julie Mason – get over it Julie, your President is black 😉 – had yet another pitiful dig at the President today for not mentioning, when he hosted the Texas A&M University women’s championship basketball team at the White House, that her beloved Rick Perry attended the college. Maybe Julie missed her buddy Knoller’s tweet….. Truly, he’s Sarah Palin in pants.